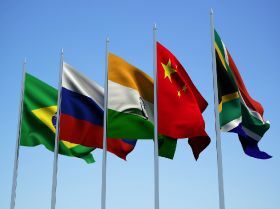 This week’s BRICS (Brazil, Russia, India, China, South Africa) Summit comes at a time when world trade is under the spotlight due to the recent trade wars instigated by the US. The BRICS partners will undoubtedly consider these developments as they promote various trade initiatives. The South African fresh produce industry is also watching developments in the hope that agreements will be signed that will allow increased sales and better access to countries of the East, particularly India and China. Following discussions in India and China, the South African industry now focuses its hopes on the summit that it, and Cyril Ramaphosa, will host. It is hoped that the new spirit of renewal and cooperation brought about by the Ramaphosa era will be taken into the discussions and that the fruit sector will also benefit from the summit. It has been rumoured for some time that the signing of an agreement giving South African pears access to China, could be signed at the summit. While South Africa prepares to sell around 30 million cartons of lemons in 2025, it is clear that the country needs to further improve market access in East Asia and South East Asia in order to boost demand and open new marketing opportunities. Access to China is at the forefront of strategies to deal with the future crop. Lemons cannot be shipped under the normal protocol temperature for citrus fruit exported to China and access will therefore depend on whether the authorities in China will accept this. In this respect negotiations with China are reported to be proceeding well and the South African recommendations have been partly accepted by the Chinese authorities. South African avocados have been riding the crest of a wave in markets in the West were demand has grown strongly during the past decade, but the industry also knows that with future growth they cannot do without the vibrancy that the Chinese market can offer to the business. The problem for the South African avocado growers is that they are at present second in line of the South African fruit categories awaiting access to China. South African pears are now being dealt with following access granted earlier for citrus, apples and table grapes. A whole host of investment agreements will be made at the BRICS summit, many of which will be announced this week. It is not clear that fresh fruit will feature. Reports from China suggests that South Africa may well become flavour of the month amongst the Chinese trade as the effect of reciprocal tariff increases between China and the US escalates. While US growers may have to contend with tougher entry conditions, the South Africans may benefit. “It may just be a time of great opportunity to build trade relations,” said one exporter.